Right now, you have some clothes in your closet that you need to get rid of. Maybe you have some items that no longer fit, or no longer fit your lifestyle. Maybe you need more space in your closet. Or maybe you've decided to embrace the minimalist lifestyle and want to purge your closet of anything that doesn't bring you joy. Here are 14 ways to get rid of your clothing. Find a local shop in your area that takes used clothing and bring it in to be evaluated. Some stores will pay you right on the spot while others may wait to pay you until your items sell. There's no easier way to get rid of your clothing than to hang it up in your yard and stick a price tag on it. Every town has a dump day. They may call it "bulky waste" day or "large trash collection day," but no matter what it's called, take advantage. Box up your used clothing that's in no shape to donate or sell and trash it in bulk on dump day. You can donate linens, blankets, and towels to your local animal shelter. Be sure to call them first to ensure they take donations. 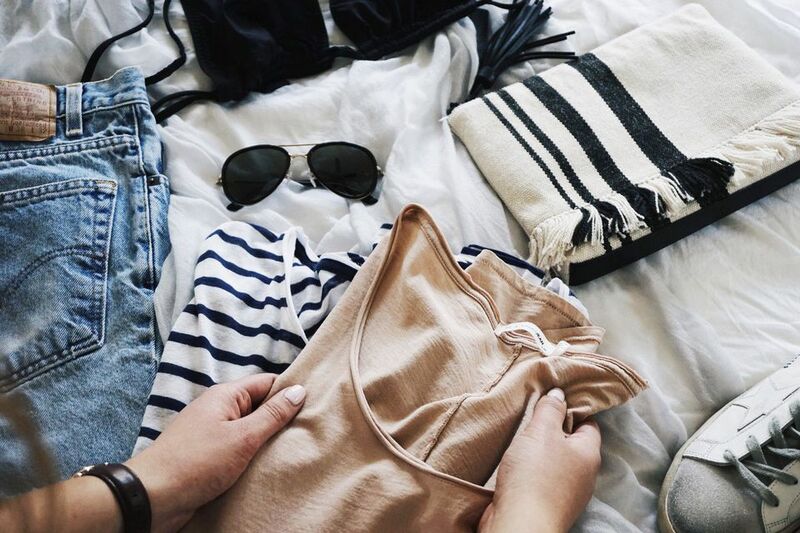 eBay, Thredup, Poshmark, Tradesy—there are so many options out there for you to try. Thredup conveniently mails you a large shipping envelope so you can pack up your clothes and mail them right back. Once they've decided on what they can sell, they send you your payout minus the cost of the shipping bag ($9.95), and you can collect it via Paypal or via a gift card to shop at Thredup itself. Tradesy works just like Thredup and, but tends to favor more high-end fashion items. Sign up online, schedule a pickup and the organization will pick up your donation right from your home. You can leave your boxes and bags of clothes right on the front porch. Just be sure to label them. After your first pick-up, they will email you the next time they have another scheduled pick-up on your street. This is great for those of us who are continually decluttering, purging and tossing. So you changed careers from attorney to yoga instructor? Or you've just decided that you no longer need 5 skirt suits and just one will do. Donate your used suits to Dress for Success, and they will get it into the hands of a woman who cannot afford business attire for an interview. Donate your clothing to support a charitable organization when they host a rummage sale. Think churches, kids' groups, women's shelters, etc. Drop off a bag or box of clothing, small home goods and linens to the Salvation Army. They'll sell your items for cheap or deliver them to a shelter for those in need. This one is a no-brainer. Call ahead to see if the shelter takes donations and how they like to receive them (boxed up, in bags, mailed in, etc.). Get in touch with your child's school administrators and suggest setting up a fundraiser to benefit the school (New books, computers, sports uniforms, prom budget—there is always something). Everyone—students, teachers, community members—can bring in their used clothing and then a group of volunteers can organize it to be sold. This is a great idea for a fundraiser because nearly everyone will appreciate getting rid of old clothing and absolutely everyone loves a good bargain. Why not? If it's not in a condition to be worn again, turn that raggedy old t-shirt into rags for cleaning. You can dust, scrub and buff household items with cotton tees or buff your coffee table with a hole-filled cashmere sweater. If you love an item but can no longer wear it (or no longer want to wear it), you can clean it or have it professionally restored and gift it to a family member or friend. But first, make sure they want this item! If not, they may be reading this list a few weeks later.